I enjoy pretty much anything wrapped in dough. This is why I adore dumplings so very much, and empanadas fall under the same umbrella of dough-wrapped love. Whether they are baked or fried, regardless of the type of wrapper, and the variety of filling, I'm tremendously excited by empanadas and have been trying out fun variations in my kitchen for years. I was surprised to discover a recipe for Ham and Cheese Empanadas in Empanadas: The Hand-Held Pies of Latin America because it isn't a flavor combination that I would normally consider to be Latin American, but after further thought, the mixture of ham, cheese, and mustard in this case reminds me very much of a Cuban sandwich, minus the roast pork and pickle. I've actually even made Cuban Sandwich Empandas in the past, which were truly exceptional, and something I should make again soon! 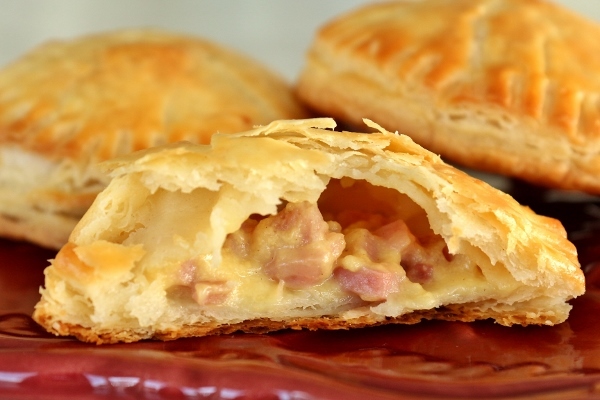 This particular recipe for Classic Ham and Cheese Empanadas hails from Cuba, Central America, Chile, and Argentina. It seems to be popular throughout many countries in Latin America, and it's quite popular in my own kitchen too at this point! The dough comes together quickly and easily in your food processor, and is bound with a combination of cold unsalted butter and cream cheese. A bit of sugar adds some sweetness to this flaky dough, which is a nice contrast to the more salty filling. 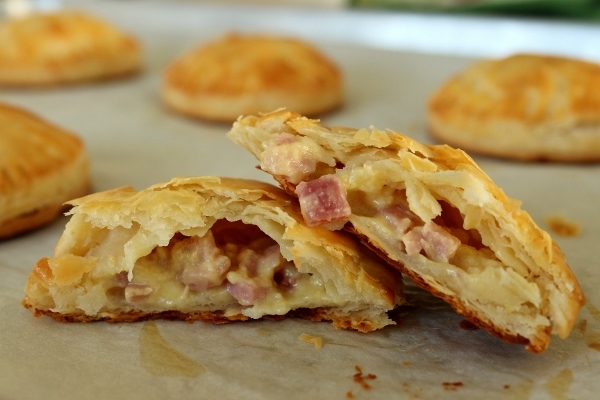 Chopped cooked ham, shredded cheese (I used a combination of cheddar and American cheeses), creamy mayonnaise and tangy mustard (I used Dijon) make up this simple yet satisfying empanada filling. 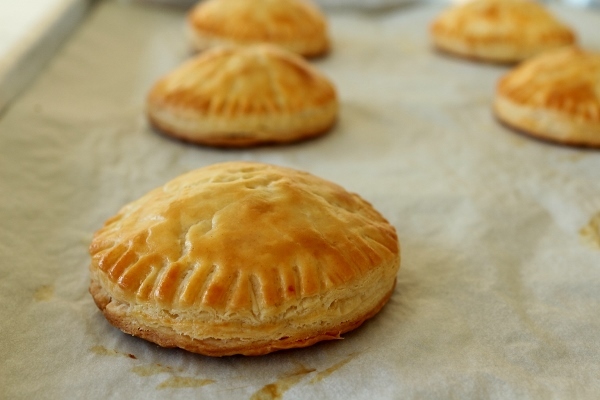 This is probably one of the easiest empanada recipes in the book, and they are baked, not fried, so that's even less of a mess in your kitchen! That's a pretty big win in my book. I yielded 14 empanadas, rather than the 16 the recipe specified. It's possible that I should have rolled my dough just a bit thinner to be able to cut more circles, although I'm not sure I would have managed 4 more circles out of the dough, even if that were the case. With that said, The amount of filling was perfect for my 14 empanadas. They also baked a bit longer than the recipe states, in my case about 23 minutes instead of 12 to 15 minutes. The result is pure comfort. 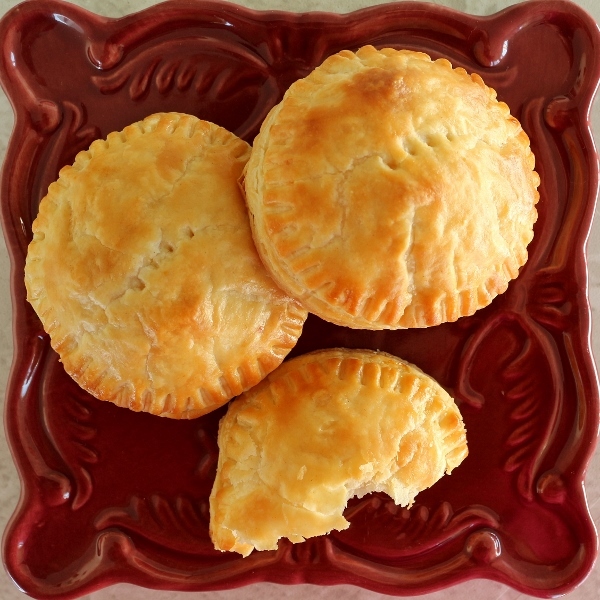 Flaky, tender, slightly sweet dough encases a creamy, salty, cheesy, tangy filling. 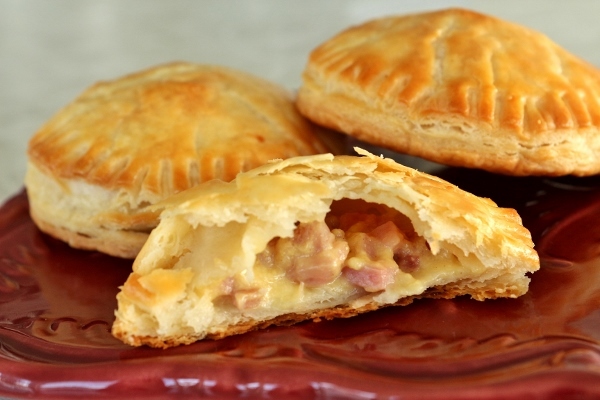 These puffy little empanadas are a real treat! I baked 6 of them and froze the other 8. I'm planning on baking those prior to an upcoming trip so my family can enjoy them as a breakfast/snack on the plane ride. They are best hot or warm, but I'm hopeful they will still taste good at room temperature on the plane. Make the dough: In the bowl of a food processor fitted with a metal blade, combine the flour, sugar, and salt; pulse for 20 seconds, or until combined. Add the cream cheese and butter and pulse until the mixture comes together and forms a ball, about 2 minutes (about 125 one-second pulses). Remove the pastry from the food processor, and divide it in half. Shape each half into a disc; wrap each disc in plastic wrap, and chill them for at least 30 minutes or up to 48 hours. You can freeze the dough up to 2 months and thaw the dough in the refrigerator overnight, before proceeding with shaping the empanadas. Assemble the empanadas: Line two large baking sheets with parchment paper; set them aside. If the dough is too cold to roll out, let it sit at room temperature for 10 minutes before rolling. On a well-floured surface and with a well-floured rolling pin, roll out the pastry to about 1/8 inch thick (like for piecrust). Keep lightly dusting flour on your surface and rolling pin as you roll so that the pastry doesn't tear or stick (for easier rolling, use a piece of plastic wrap or parchment paper directly over the top of the pastry so that the rolling pin doesn't stick). Using a 3 1/2-inch cutter, make 32 rounds, rolling and cutting the scraps as needed (if you need to re-roll the dough, brush excess flour off the scraps with a clean pastry brush and gather up the scraps; wrap them in plastic and chill them for 10 minutes). 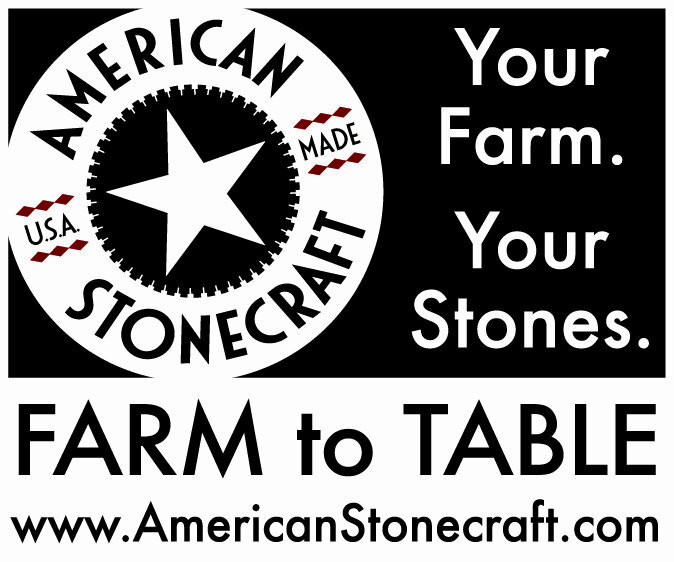 Keep them covered as you work. 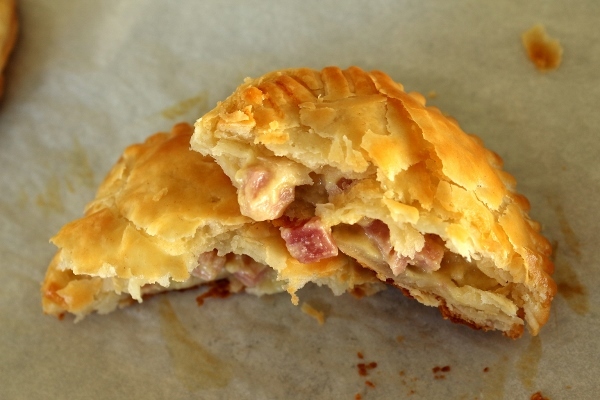 Place a generous 1 tablespoon of filling in the center of half of the pastry rounds. 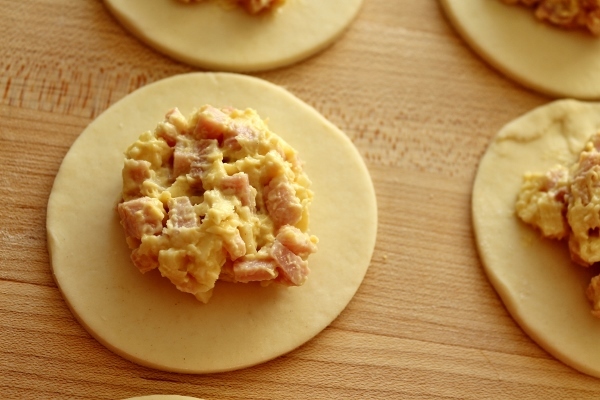 Working with one round at a time, brush the edges with the egg wash and place another dough round over the filling. Use your fingers to seal the empanadas (they will look like ravioli), being careful to press the air out of the dough as your fingers move to the edges. Seal the edges very well with your fingers and then press them together with the tines of a fork; use the tines of the fork to poke vents on top of each empanada. Transfer the empanadas to the baking sheets and chill them uncovered for 20 minutes (or up to 8 hours). Bake the empanadas and serve: Preheat the oven to 400 degrees F. Brush the tops of the empanadas with the egg wash. Bake the empanadas until they are golden, 12 to 15 minutes (rotate the pans in the oven halfway through baking, back to front and top to bottom, to ensure that all of the empanadas bake evenly--mine baked longer, for about 20 to 25 minutes). 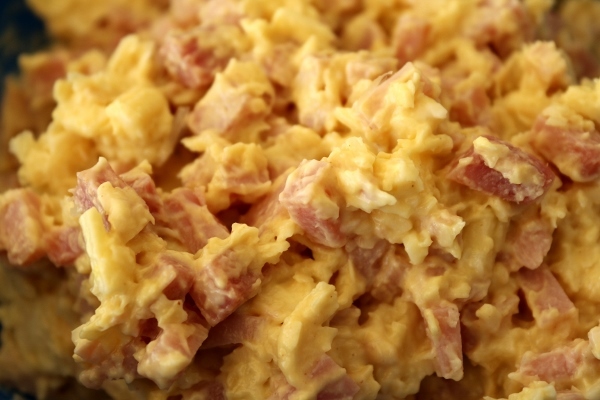 Let them rest 2 to 3 minutes and serve them warm. 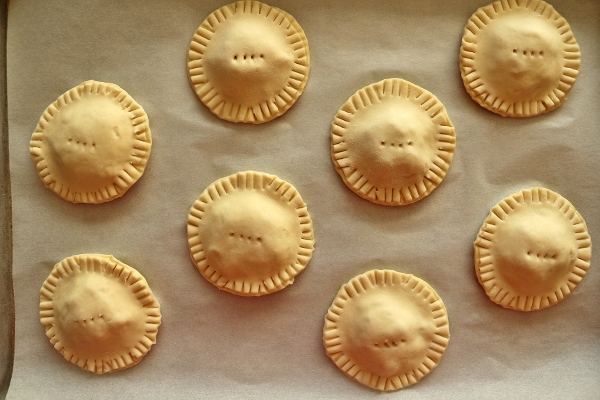 *Cook's Note* To freeze the unbaked empanadas, do not brush the tops with egg wash. Place them in one layer on the prepared baking sheets and freeze them until solid. Transfer them to freezer-safe bags or bins and keep them frozen for up to 4 months. 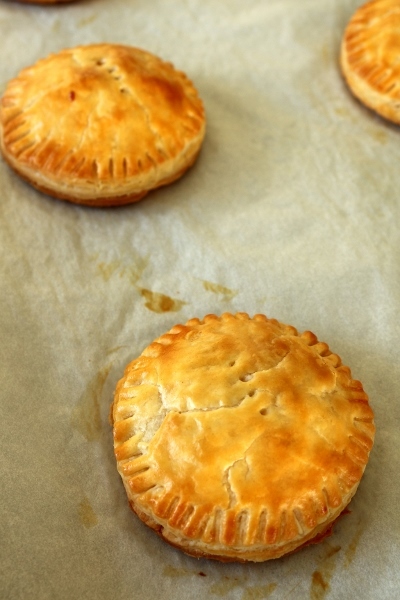 To reheat, brush the tops of the frozen empanadas with the egg wash. Bake them directly from the freezer. Add 3 to 5 minutes to the baking time, or bake until the empanadas are lightly golden.